Charles John Huffham Dickens, the master story-teller, was born in Landport, England, February 7, 1812. His father was a clerk in one of the offices of the Navy, and he was one of eight children. When he was four years old, his father moved to the town of Chatham, near the old city of Rochester. Round about are chalk hills, green lanes, forests and marshes, and amid such scenes the little Charles's genius first began to show itself. He did not like the rougher sports of his school-fellows and preferred to amuse himself in his own way, or to wander about with his older sister, Fanny, whom he especially loved. They loved to watch the stars together, and there was one particular star which they used to pretend was their own. People called him a "very queer small boy" because he was always thinking or reading instead of playing. The children of the neighborhood would gather around him to listen while he told them stories or sang comic songs to them, and when he was only eight years old he taught them to act in plays which he invented. He was fond of reading books of travel, and most of all he loved The Arabian Nights and Robinson Crusoe. He had a great affection for Chatham and Rochester, and after he began to write stories that were printed, he often used to put these places into them. It was at Chatham that poor little David in the story, David Copperfield, lay down to sleep when he was running away from London to find his aunt, Miss Betsy Trotwood. It was to Rochester that Mr. Pickwick in Pickwick Papers, rode with Jingle. Rochester was really the "Cloisterham" where the wicked choir master, John Jasper, killed his nephew, in The Mystery of Edwin Drood. And it was in those very marshes near by, that Magwitch, the escaped convict in Great Expectations, so frightened little Pip. It is easy to see that the young Charles Dickens noted carefully and remembered everything he saw, and this habit was of great use to him all his life. These happy years were not to last long. When he was nine years old, his father became poor and the family was obliged to move to London, where it lived in a shabby house in a poor suburb. Before another year had passed, his father was put into prison for debt—the same prison in which Little Dorrit, in the story of that name, grew up. A very bitter period followed for the solitary ten-year-old boy—a time in which, he long afterward wrote, "but for the mercy of God, he might easily have become, for any care that was taken of him, a little robber or a little vagabond." The earlier history of David in David Copperfield is really and truly a history of the real Charles Dickens in London. He was left to the city streets, or to earn a hard and scanty living in a dirty warehouse, by pasting labels on pots of blacking. All of this wretched experience he has written in David Copperfield, and the sad scenes of the debtors' prison he has put into Pickwick Papers and into Little Dorrit. Even Mrs. Pipchin, of whom he told in Dombey and Son, and Mr. Micawber in David Copperfield, were real people whom he knew in these years of poverty and despair. 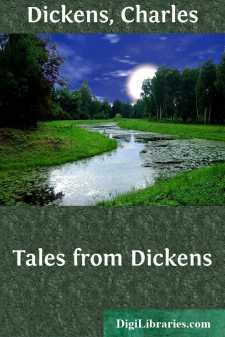 Dickens's life at this time was so miserable that always afterward he dreaded to speak of it, and never could bear even to walk in the street where the blacking warehouse of his boyhood had stood. Better days, however, came at last. He was able to begin school again, and though the head-master was ignorant and brutal (just such a one as Mr. Creakle in David Copperfield) yet Dickens profited by such teaching as he received. After two or three years of school, he found employment as clerk in a lawyer's office. This did not content him and he made up his mind to learn to write shorthand so as to become a reporter, in the Houses of Parliament, for a newspaper. This was by no means an easy task. But Dickens had great strength of will and a determination to do well whatever he did at all, and he succeeded, just as David Copperfield did in the story.